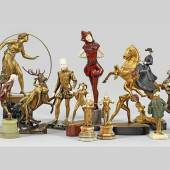 Summers Place Auctions will be selling some of the highlights of John Robinson's career as a sculptor on Tuesday, 25th September 2018. 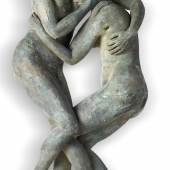 John Robinson (1935 – 2007) carved out an international career as a sculptor spanning over 40 years. After joining the Merchant Navy at the age of 16 and jumping ship when he got to Australia, he tried his luck at jackerooing and cattle droving in the remote Kimberley region before settling down to become a sheep farmer. 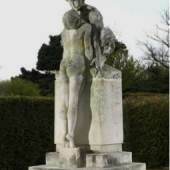 In the 1960s he decided he wanted to rekindle his interest in sculpting, something he had enjoyed as a schoolboy at Rugby school. He eventually persuaded his wife that they should travel around Europe with their young family to explore the possibilities of a career as a sculptor. Luckily, his ambition gained momentum once he made the acquaintance of the celebrated sculptor Enzo Plazzotta in Chelsea. 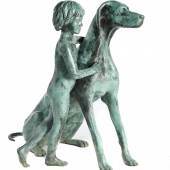 They got on famously and Enzo introduced John to his foundry in Pietrasanta, Italy, which John used for many years. 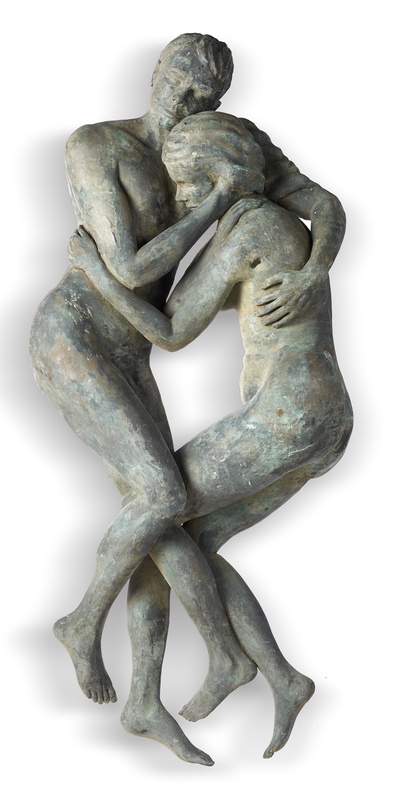 John started with figurative sculptures, mainly focusing on children and athletes; h Acrobats The last one is now avail- able in this auction and estimated at £10,000 -15,000. 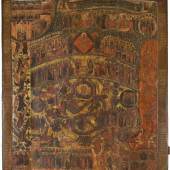 The monumental bronze resin group, which is 5 metres high, was originally conceived on a trip to Greece in the 1970's. 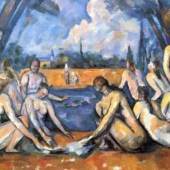 Based on the original Olympian athletes dating back to the 8th century BC in ancient Greece. John started it with a 16 inch bronze maquette, which he then scaled up to the monumental scale it is now. 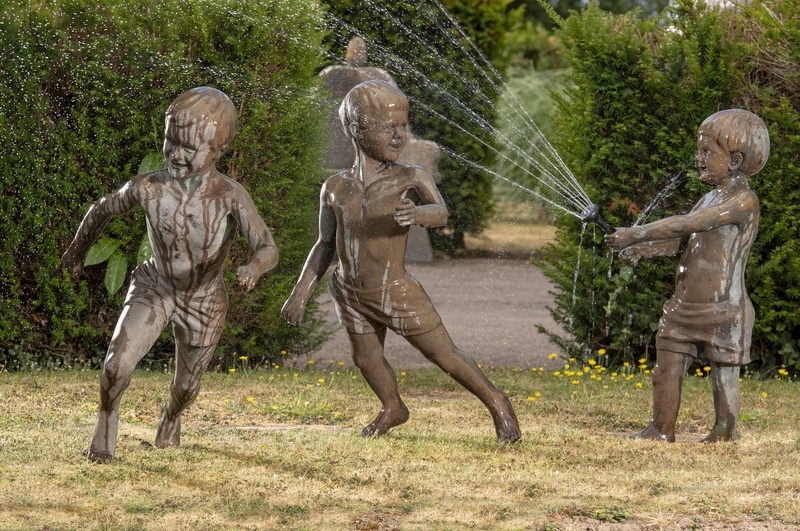 Three bronze resin figures of Peter, squirting Mark and Tim with a hose pipe from 1969, the tallest 97cm high, is expected to fetch £2,000-3,000 while a bronze of Genevieve sleeping carries an estimate of £1,500-2,500. 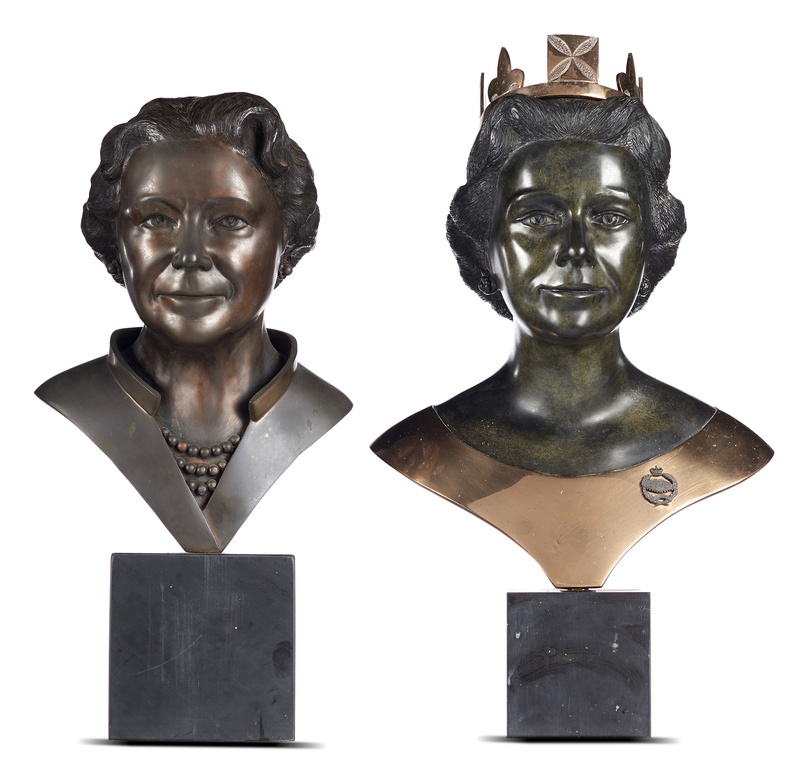 Peter Robinson, the sculptor’s son and a sculptor in his own right – and working under the name of 'Lyell' - remembers when his father was commissioned to sculpt Her Majesty the Queen and Queen Elizabeth, the Queen Mother, and how many lovely stories his father and mother came back with. How surprisingly relaxed both of them were when sitting for John and how worried he was when he drove up to the gates of Buckingham Palace on his first visit, wondering whether the guards would let him in after the crowds in front of the gate reluctantly made way for him. It was a great joy to find out that the Queen Mother liked the primroses from his wife Margie's garden so much she took them all the way to Scotland with her. Peter also remembers with fondness that even as a young man, he and his brothers went to Portsmouth to watch the unveiling of the his father’s sculpture, Bonds of Friendship and witnessed the Queen and the Duke of Edinburgh thanking John and Margie, only to nearly miss their train back to London to get there in time to jump on a bus to Greece! The original plaster heads and bronze castings of both her Majesty the Queen, and Queen Elizabeth the Queen Mother, together with the actual tape measure used to measure their heads for the commissions are also included. 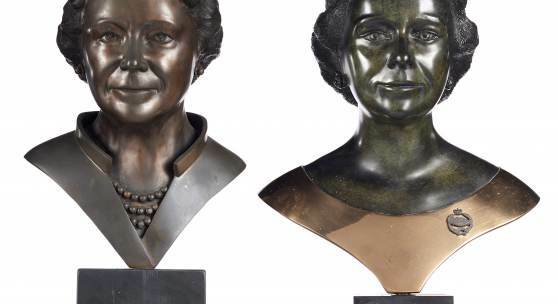 The bronze portrait busts are estimated at £200-400 each and the plaster busts £150-250 each. Having started as a figurative sculptor and taking commissions from families to sculpt their children or sports organisations to commission specific athlete sculptures. 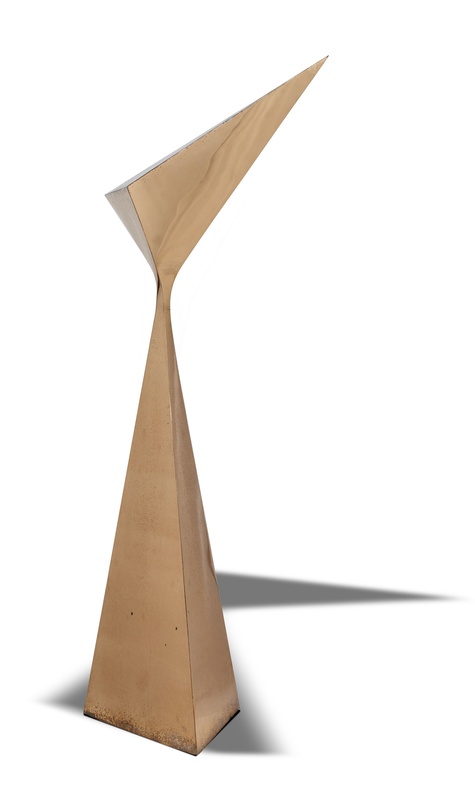 John Robinson soon started to explore the more abstract forms. 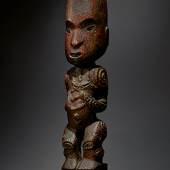 He had also been influenced by seeing some of the ancient art in Kimberley, which made him look into the origins of art and artistic creativity and humanity in general. 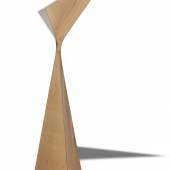 These abstract sculptures became part of his celebrated Universe series, exhibited at the International Congress of Mathematical Instruction. Much admired by academic Institutions due to their mathematical brilliance, examples can be seen at The Isaac Newton Institute in Cambridge, and the Universities of Harvard, Montana, Oxford, Sydney, Toronto, Wales and Wisconsin. 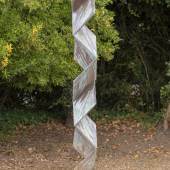 Part of this series and included in the sale is a painted and stainless steel abstract group entitled Evolution, which is 190 cm high and was inspired by a trip to Romania in 1996 when John fell under the influence of Constantin Brancusi, it is estimated at £1,500-2,500. 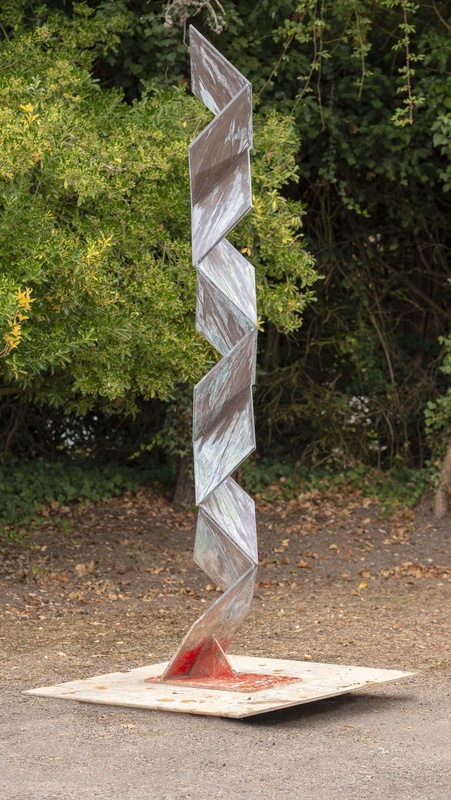 Even more striking is a 2 metre high abstract bronze sculpture entitled Elation, a cast of which was gifted by the British Olympic Association to the International Olympic Committee and which carries an estimate of £1,000-2,000.